St Thomas Church01621 776846 work ChurchThe Church of St. Thomas in Bradwell-on-Sea dates back to the 14th century. The nave was rebuilt in 1706 and the tower in 1743. We are a happy friendly church offering a warm welcome to all. We have services every Sunday, 10.30am communion on the first and third Sundays, 10.30am all age services on the second and forth Sundays, 8.00am Holy Communion on the forth Sunday and an evening service at the Down Hall Care Home at 3.30pm on the first Sunday of the month. On the fifth Sunday, we have a joint service with St. Lawrence Church. The parish is proud to support our Church school that has very close links to our church community. The school regularly uses the church facilities for services and meetings. We have an active and enthusiastic team of bell ringers who practice each Friday at 8pm, and ring for all Sunday services. There is a Thursday social group which is open to everyone in the parish who wish to meet and chat or have meals together. The group either meet in the church or go for a meal on the first Thursday of the month. We have an excellent group of flower arrangers who arrange flowers in the church each week and at all the church festivals. We also have beautiful Flower Festivals on special occasions. St. Thomas Church also support and help maintain St. Peter’s Chapel which we have the use of on Sundays and Church Festivals. 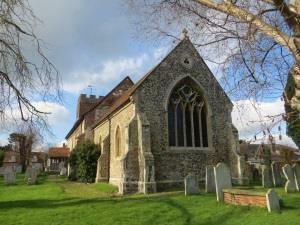 The Church of St. Thomas in Bradwell-on-Sea dates back to the 14th century. The nave was rebuilt in 1706 and the tower in 1743. We are a happy friendly church offering a warm welcome to all.